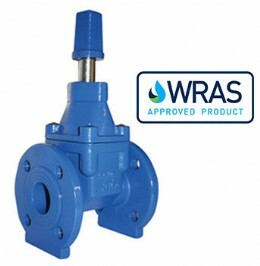 T-T Flow is delighted to announce that they have been awarded renewal of accreditation from the Water Regulations Advisory Scheme Ltd (WRAS) for their range of Aquavault valves. The Aquavault, resilient seat wedge gate valve is used for pipeline isolation and is suitable for potable water duties and buried service. WRAS contributes to the protection of public health by preventing contamination of public water supplied by pumping wastewater away. They also encourage the efficient use of water by promoting and facilitating compliance with the Water Supply Regulations and Scottish Byelaws. These require that a water fitting should not cause waste, misuse, undue consumption or contamination of the water supply, and must be �of an appropriate quality and standard�. WRAS approval is granted directly by representatives of the water suppliers and is accepted as evidence of compliance by every water supplier in the UK. To qualify, the full range of Aquavault, resilient seat wedge gate valves (DN50-DN300) has undergone rigorous testing procedures to gain the approval. The now fully WRAS approved Aquavault Valves offer unique and lightweight epoxy coated ductile iron bodies, EPDM rubber coated ductile iron wedges and non-rising spindles with hand wheel or cap operating members. Features also include integral captive wedge nut for optimal lifespan, wax filled fasteners for corrosion resistance and stem seals of which are replaceable under pressure. They offer a maximum working pressure of 16 Bar and are suitable to work in temperatures ranging from -10�C to 70�C. These models are available with optional chainwheel, position indicators with optional switches, anti-clockwise spindle, by-pass assembly and alternative flange drillings. T-T Pumps work hard to ensure all products are of the highest quality and continually work to demonstrate compliance with regulatory bodies. WRAS approved products can be identified through the WRAS logo displayed on product pages. You can also find our range of WRAS approved clean water products here. These products join an extensive range of WRAS approved products. To find out more about this accreditation or to speak to a member of the technical team, contact us on +44 (0) 1630 647200 or via email at response@ttpumps.com.